This week I had the honor of participating on an alumni panel at the University of Texas San Antonio (UTSA). This was my chance to give back, by sharing some advice with the incoming students of the various graduate programs offered by the business school. Standing in front of a full room of future M-somethings, I answered questions about why I pursued an MBA, how I made the most of the program, and how my degree prepared me for the role I have today. Most of these questions were shared with me in advance, so that means I had prep time to craft what I hoped would be thoughtful answers. Half way into it, I thought things were going well. But then, the discussion moderator, Peter, decided to throw the panel members a curve-ball in the form of an impromptu question for each of us. What was he thinking?! There’s nothing quite like a little improvisation in front of a few dozen eager graduate students, with their eyes locked on your position. Leaving me very little time to produce a response, Peter asked, “Alan, what advice do you have for aspiring leaders?” Peter directed this question at me in particular, because he knows that I spend a lot of my time thinking about, talking about, and teaching leadership to both students in an academic environment and business leaders in a corporate setting. Surely I would have a great answer, right!? I jokingly responded, “That’s a great question, Peter. Do we have an hour to really dig into it?” I hoped it was not obvious to the audience that I was only buying time with this initial response while I thought up my real answer. Peter said, “I’ll give you two minutes.” This was serious business. Fortunately, everyone laughed. When that died down, they stared at me, waiting for an answer. My mind churned quickly. 1. To be a great leader, one must first be a great follower. I say this because I believe many of the qualities that are desirable in a leader are the very same qualities we look for in our followers. So, there is a thin line separating the two, and if you can’t be a great follower, you may ultimately struggle as a leader. Check out my post, Follow by Example, for more of my thoughts on what it takes to be an effective follower, and why I think they’re important. 2. I’ve seen new leaders try to act like some ideal image of a leader they have in their minds. But what happens is they become robotic or hollow in their attempts to be something or someone they are not. And people end up seeing right through it. On the other hand, when leadership comes from an honest place, informed by your unique self, it tends to result in the sort of authenticity that inspires people to act. Check out my post, Leadership Takes the Stage, to explore five techniques for ‘being a leader,’ not just ‘acting’ like one. 3. We often get promoted into leadership positions because we’re good at being individual contributors. Then when things get tough as the leader, we have a tendency to fall back into our comfort zones and do the very same things that got us promoted in the first place. But that’s not our jobs anymore, and the unfortunate result is twofold: One, we’re not doing our new job. Two, we’re preventing other people from doing theirs. Our new leadership job is to direct, guide, coach, mentor, and develop others. Yes, we still have to get the work done, but we need to do it through others. And when we do that, we get to watch them succeed, and we celebrate their many accomplishments. Check out my post, Ish Happens, for other signs that we may not be fulfilling our true leadership roles. So those are my 3 secrets to great leadership in 3 seconds. I know these aren’t the only secrets out there, and they may even hardly qualify as secrets. In the end, though, I think it is a pretty good list, because these are important reminders for all leaders, new and experienced. The M-somethings seemed to like it and that’s what matters for now. 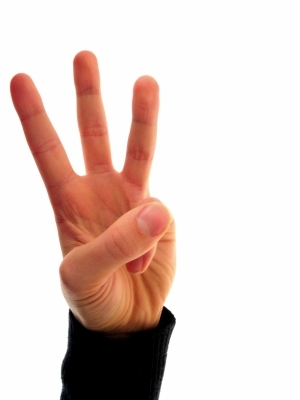 What if you only had 3 seconds to come up with 3 secrets of great leadership? What would yours be? Time yourself, write them down, and share them below. Pingback: Are You Ready For That Promotion? Ask Yourself These Questions | TAL Group, Inc.